Rwanda people are friendly and always look smart in their cultural wear known as ‘Mushanana’ which attracts the tourists while on their safaris in Rwanda. Tourists always try putting it on while on their visits in Rwanda and they look so smart. They always have photos which they show to their friends so as to attract them to come for Rwanda tours. It was before made from back cloth but now it is made from different materials. It is a lengthy skirt that covers one shoulder and looks so nice therefore attracting tourists on visits in Rwanda. One respects when you are putting on this attire because it doesn’t show your body parts down. They also tie their foreheads with decorated ribbons which make them look smarter. The Rwanda cultural attire is worn on ceremonies like the weddings, introductions, church services, and also dancers use these attires for performing their dances hence entertaining tourists on their tours in Rwanda. 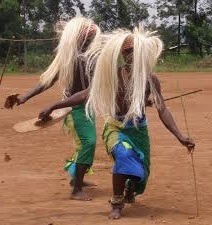 The tourists are also attracted to trying the dance hence finding their Rwanda visits the best. This increases the number of tourists coming for safaris in Rwanda hence boosting the tourism sector.